Starting a new web project is not a problem today. This is specially true if you use different CMS platforms. They help to manage website data and construction very fast and with great pleasure. However, before installing a CMS platform you will have to purchase web hosting. This is quite a hard process, so in this article we’ll tell you more about good web hosting for CMS platforms. One of the most popular platforms that allows you to manage your website data is WordPress. Originally created as a system for bloggers, today it has grown to something much bigger. Now using WordPress for an eCommerce project, a promo website, a photo gallery, a portfolio, and a lot more is easy as pie. You will just need to choose appropriate WordPress theme, and start the game! As you’ve already understood, it’s extremely important to choose good web hosting. However, as soon as you start the search you’ll see there are lots of web host companies offering you some exciting features, various extras and bonuses. From among all features of web hosting, you should first of all pay attention to such basics as bandwidth, disk space, number of domains, databases and support features. Also, you will see many web hosts offer you to choose Shared, VPS or Dedicated packages. You should know shared is best for start-up projects and some personal sites that don’t require much productivity. VPS is good for hosting quite big projects with serious systems of databases and high productivity requirements. Dedicated servers are a high-end solutions giving you lots of bonuses that will help your big project grow to something even better and bigger. 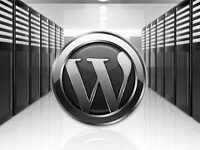 Many hosting providers tell you they have a possibility to install WordPress with only 1 click. This is true, and it’s a very good option. However, we do recommend that you check the provider’s version of WordPress software that is expected to be installed. Often it’s outdated, and you’ll have to install wordpress manually, which is not too complicated though. It’s really great if your web host offers a free domain. This will help you save some money and get better domain service from your hosting company. Still, be ready for unfair domain prolongation prices that may be really high. Also, be smart while choosing the domain name — it should be SEO-friendly and hint on the idea of your project. Technical characteristics are very important, too. Check all specs including bandwidth, disk space, number of domains, hardware quality, etc. The newer your server hardware will be, the better it is for your project — it’s obvious. Also, good bandwidth and disk space will let your website grow fast without any web hosting adjustments and plan changes. Monitoring is a must. Your web host company should have 24/7 website monitoring for crash cases and some malfunctions. Backups are a great bonus. Some companies will backup your website only within certain disk space limits, so check this information before purchasing this or that plan. This is an extra, of course. However, for some $30/year you’ll get lots of bonuses that will make your project more reliable and save, especially if you have an eCommerce website. All decent web hosts will have this option for a certain extra fee, so check it before making the order. The more databases you will have included into your hosting plan, the better it is for your website. It’ll make your project more scalable and extend user-friendliness options. Be aware that some web hosts also offer you unlimited databases, which is a great option of course, but it’s worth checking all peculiar conditions in this case. Basically, this is not quite a hosting tip, but still. It would be great to install one of the numerous WordPress plugins that improve cache processing for your website. This will also upgrade the functioning of your web hosting. However, we advise you to consult customers support before installing this or that plugin — they may give you some good tips regarding this issue. WordPress functioning is tightly connected to database processing and coding. That’s why we insist that you check PHP and MySQL versions installed on the servers of your potential web host company. For instance, having PHP 5.2.4 or greater, and MySQL 5.0 or greater is really good and unties your hands for lots of coding magic in your website. Check the web for information regarding the regularity of security upgrades of web hosting providers you like. The more secure their system is, the more resistant your website will be regarding various viruses, DDOS attacks, etc. Security is very important for keeping the stable flow of clients arriving to your website. Of course, 24/7 support is a must. We really advise you not to deal with web hosting without this option. Really, anything may happen in any moment, so you need constant support. The best option is a 24/7 Live Chat and a 24/7 toll-free phone number, however only one of these options will already be enough to feel sure that your problems will be resolved fast. So, as you see, it’s quite hard to unite all mentioned features in one hosting provider. However, it’s worth considering the companies that meet at least 7 of 10 stated requirements. Hopefully, our tips will help you make a correct choice, and purchasing great web hosting will be a good start of a big and fast-growing web project.